Recently we reviewed a rackmounted Thecus N16000PRO NAS which lets the administrator install and use up to 16 SATA or SAS HDDs. However, sometimes this number of hard discs may not be enough even if one uses all 16 data carriers with the maximum memory capacity. For cases like these Thecus company offers several variants of increasing the available disk space of the DAS. We will review all of these possibilities in one of the articles that will be released soon, whilst today we are going to focus on a device, Thecus D16000 that was developed exactly for purposes like this. D16000 looks very similar to N16000PRO NAS, but doesn't have a built-in CPU and RAM, which makes it significantly cheaper. However, let's take our time and tell you about everything in parts. Thecus D16000 DAS is rackmounted and occupies three units in a common 19" communication rack. The device dimensions are 130х480х518 mm. Its front panel is completely covered with a perforated door that has an LCD which shows information about the device current parameters. There are 16 disk bays located behind the door as well as power ON/OFF button. Side panels of the device case are not remarkable at all. The biggest part of the rear panel of the device case is a ventilation grate under which there is a module used for connecting the device to a data storage system and the second expansion unit, if any. Also, there are two 500W power units located over here. 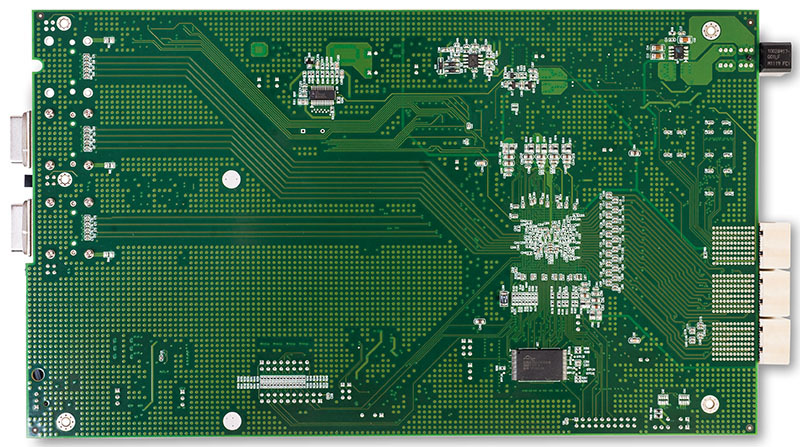 The interior space of Thecus D16000 is visually divided into three unequal parts: one used for disk installation, another one used for power unit location, and hardware one. 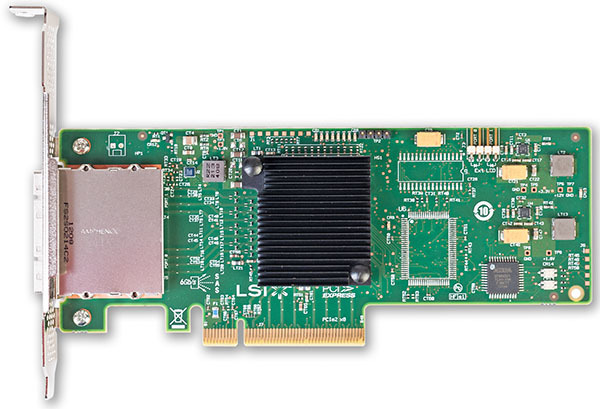 'The hardware part' is probably not that much of its name since there is only an LSI SAS 2X36 SATA/SAS switch located on the green textolite card. It is connected to the RAID controller installed inside of the master NAS (LSI 9200-8E). 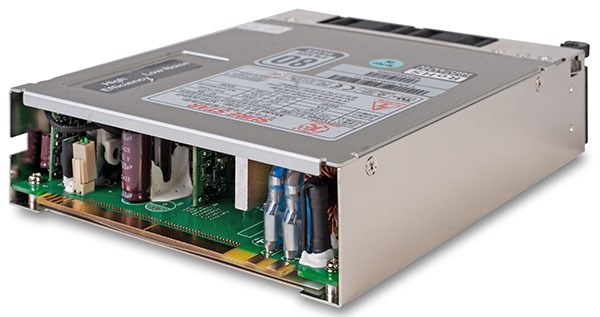 Fans that are located inside of the case (two units) and in the power units (four units) answer for cooling of the device. Unfortunately, we didn't manage to find means of remotely monitoring either the state of the hard discs inside of D16000 or the entire device. 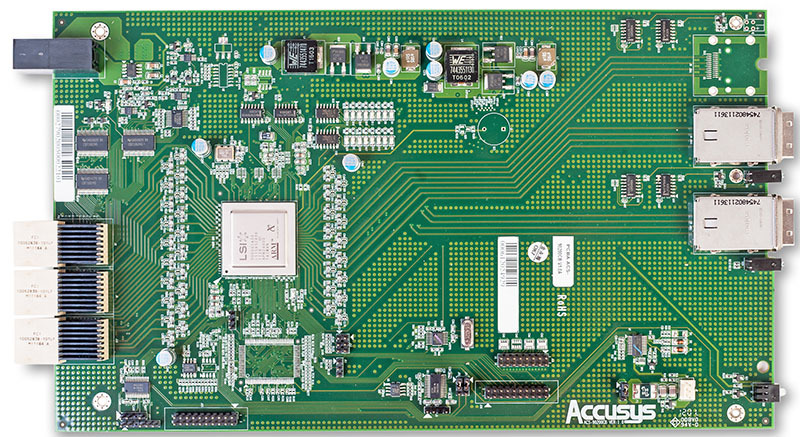 That is where we bring the review of the hardware platform of Thecus D16000 expansion unit to a conclusion and pass on to testing it. Since there is no CPU, RAM, and network interfaces, D16000 cannot be considered a standalone network device. That's why some of our standard tests were inapplicable in this case. Particularly, we could not measure the device booting time accurately or check its integrity using a network security scanner. It'd be fair to mention that obviously we could get a certain estimate for the booting time that we received using indirect factors. The device boots in approximately 5 to 10 seconds (not considering the time needed for switching on of the discs). Also, we would like to say a few words about loading of the device. 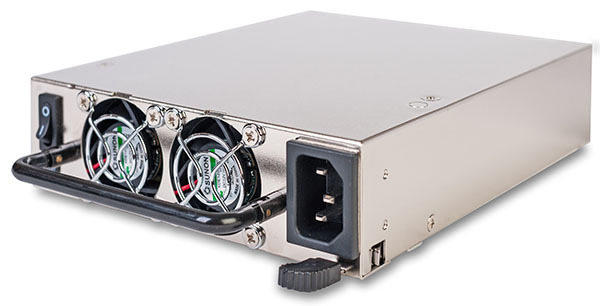 Thecus D16000 has an ON/OFF power switch on its case. In other words, remote switching on and off is not supported. However, we were not preoccupied by it. Upon being switched on D16000 starts supplying all of its discs with power at the same time. 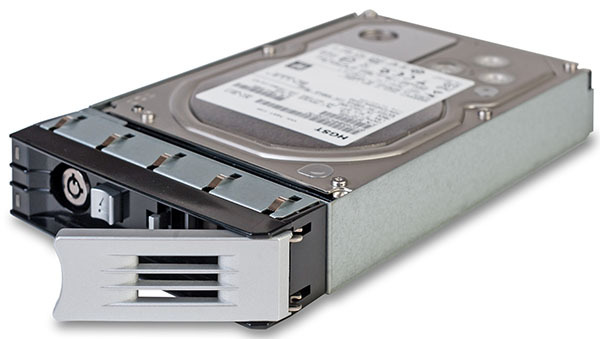 It is commonly known that the power consumed by an HDD upon being switched on is full. This way if there's a power failure in the data centre that causes blacking out of several D16000 expansion units at the same time, then it may lead to another failure upon power restoration due to the increased power consumption by the device. It seems to us that the developers should have considered this during the device development. 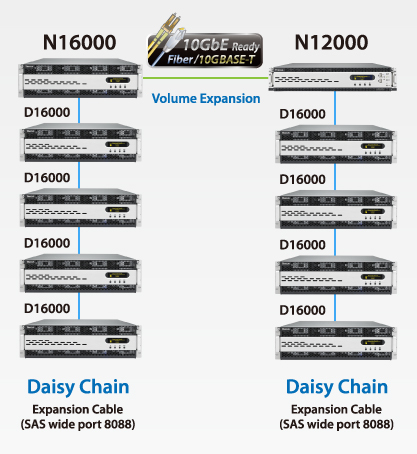 Apart from it, we would like to clarify the scheme of connection of DASes to NASes provided by the vendor. One of the original schemes is presented below. This scheme shows connection of four D16000 units in a successive order. However, in reality simultaneous connection of two chains, two D16000 in each, is taking place. A more accurate scheme is presented below (it was taken from Thecus website too). We decided to provide brief information about the test stand we used before unveiling our readers results of the performance testing. We used Intel NASPT utility, version 1.7.1, in order to test the access speeds. The amount of RAM of the test PC available to the OS has been intentionally decreased using msconfig utility in order to comply with Intel's recommendations. 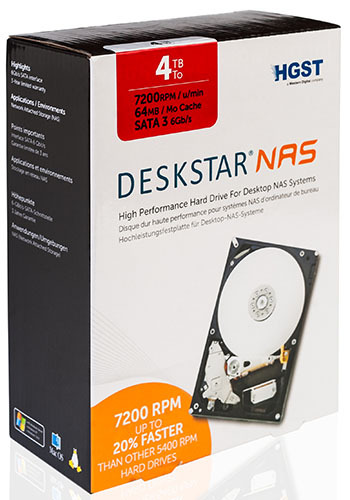 We used 16 4 TByte HGST Deskstar NAS 0F22408 HDDs instead of the ones we used previously. The above-mentioned HDD model is meant to be used in multidisc systems. That's why the disk is powered by RVS system, standing for rotational vibration, that decreases the data carrier proper vibration and mitigates the influence of the exterior vibrations on the device operation. RVS technology possesses several sensors that are installed very close to the tape reading head. Information about vibrations received from the sensors is then used for stabilizing the position of the reading head in reference to the disk plates. An approach like this allows for disk drive stabilization and increased accuracy of positioning of the reading heads in reference to the track without losing time on extra moving. This, as the vendor claims, lets significantly increase access speeds to the user data. 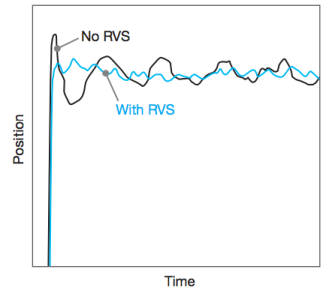 An example of dependence of the reading head position from the time upon usage of RVS and without it is presented on the picture below. Unfortunately, one cannot disable RVS technology, and therefore we could not perform our own measurements of its influence on the reading/writing speed. The first thing we decided to begin our testing with was comparing the performance of three file systems: EXT3, EXT4, and XFS. Usage of EXT3 file system in up-to-date data storage systems is impossible due to its limitations, but still we decided to include it in the test. Measurements were carried out using SMB and iSCSI protocols in RAID0 array that contains four HDDs. 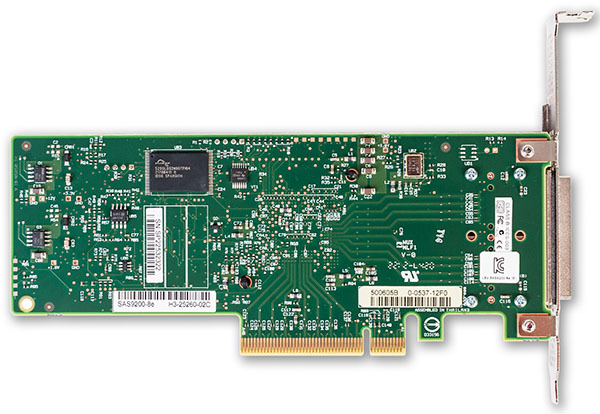 Thecus N16000PRO NAS lets one create disk arrays not only using proprietary data carriers, but including the ones located in the disks enclosures too. We decided to compare what influence the physical location of an HDD has on the access speeds to it. In order to do this we created RAID1 array containing two disk drives in a way so that the disks are located in different devices. Access was provided using SMB protocol and XFS. Also we decided to compare the performance of RAID60 arrays with EXT4 file system upon access using SMB protocol. 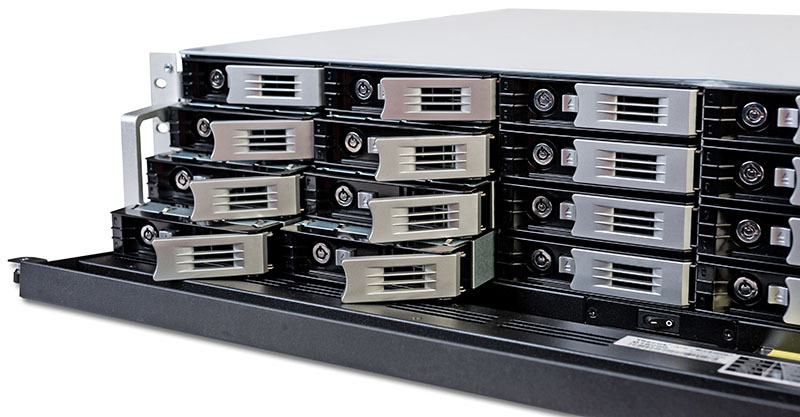 We are comparing RAID60 arrays powered by disks that are located only in one device (data storage system or expansion unit) intentionally in order to get rid of ambiguity of any kind associated with the type of disks that are to be used during the test. 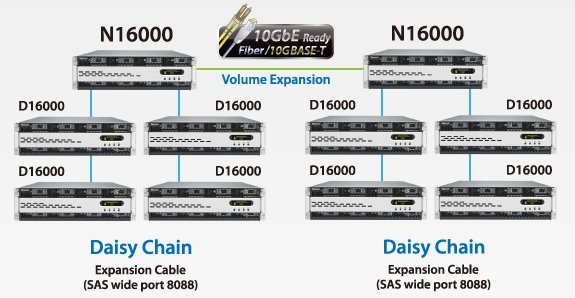 As we can see from the test results, access speeds to the data located on the disks in D16000 are almost equal to the ones that were measured with a standalone N16000PRO. In some cases, they even surpass the corresponding performance indices of the data storage system. However, we believe the differences in figures that we managed to receive are insignificant and may be considered an instrumental error. Now let's go back directly to measuring the performance of Thecus N16000PRO NAS together with D16000. Below one can see the measurement results of the data access speeds upon SMB protocol using EXT4 and XFS for all supported disk arrays. All 16 disks installed in the expansion unit were used in order to build the array. Now let's carry out the same measurements but using iSCSI protocol. The available disk space on the test PC was successively formatted using NTFS and FAT32. In the review of Thecus N16000PRO NAS we promised our readers to examine possibilities of increasing the disk space available to the data storage system users. One of such methods is using additional Thecus D16000 disk enclosures. That was exactly the model we tested today in our laboratory. Generally, we are quite glad about the device performance working together with N16000PRO NAS. One of our next articles will be dedicated to the other methods of increasing the disk space available to the users. 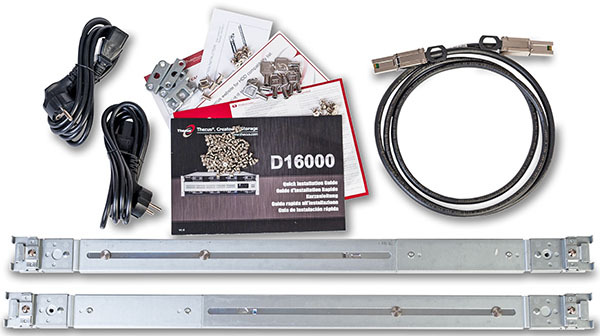 The strength areas of Thecus D16000 expansion unit are presented below. As of when this article was being written, the recommended price for Thecus D16000 (not including the discs) was 160,650 roubles.